We know you’re the creative type, just bursting for an outlet for all the fantastic ideas dancing around in your head. Ok, maybe you’re not the next Leibovitz or Warhol, but even the artistically challenged can take these super easy ideas and make fantastic gifts for the Instagram-obsessed folks in their life (or, you know, for yourself). You may know this already, but StickerYou prints photo stickers, and app sensation, Instagram, lets you take some really cool pics with your camera phone and add filters to make it look like you actually know what you’re doing with a lens and a flash. Combine StickerYou and Instagram and you get….Ta dah!!! StickerYou’s Guide to awesome Instagram pic gifts! 1 - Photo Mug: Have a coffee drinker in your life? Stick photo stickers all over a blank mug you can purchase at any housewares store or department store. Then put the mug in the oven at 400 degrees F for about 10 mins. Remove with oven mitts and let cool. The heat in the oven solidifies the photo stickers’ adhesive making them permanent. They’ll stay on in the dishwasher and microwave. 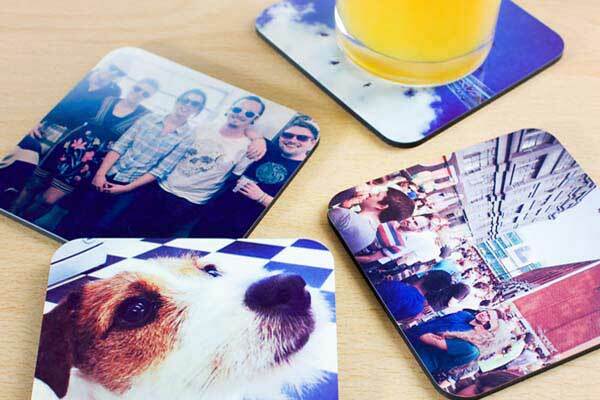 2 - Photo Coasters: Alright, maybe it’s not coffee they drink. Pick up four to six 4x4” ceramic tiles or cork sheets at a local home improvement, supplies or craft store. Clean the surface, dry, and then stick those photo stickers on top. Easy peasy. Now you have a set of decorative conversation starters for your social gatherings. 3 - Photo Magnets: We’ve all got that friend who sticks a lot of coupons to their fridge. Or maybe its take-out menus or the phone number of whomever slept over last night. This person needs some custom photo magnets of some beautiful images. Buy some sheets of magnet from the local home improvement or craft store, stick your photo pics on top, and then trim the magnet sheet to each sticker. Voila, a set of Instagram magnets. StickerYou also makes custom magnets so if you don’t want to do all the footwork yourself, just make it all online and we’ll ship the finished photo magnets right to you. 4 - Picture Wine Labels: Now these are fun. Have any embarrassing Instagram pics of your slightly intoxicated friends or family? Peel the labels off an existing wine bottle, then slap those new photo stickers on the bottle instead. Also works for beer bottles. Just a reminder of what happened last time they finished the bottle. 5 - Photo Candles: Does your bff love scented candles? Stick a few sticker pics of you together having a blast on some clean scented candles you can pick up at any home or department store. Put them in a cute holder and there you go! A quick and sentimental gift.